Parking at the Falkirk Stadium is by permit only on match days. Alternative parking is available at Falkirk College Middlefield Block and Main Building car parks. The car parks are located at the rear of the College buildings on Grangemouth Road. Car park overflow signs are currently in place to direct you to the site. On street parking can be found in the nearby West Mains industrial Site. 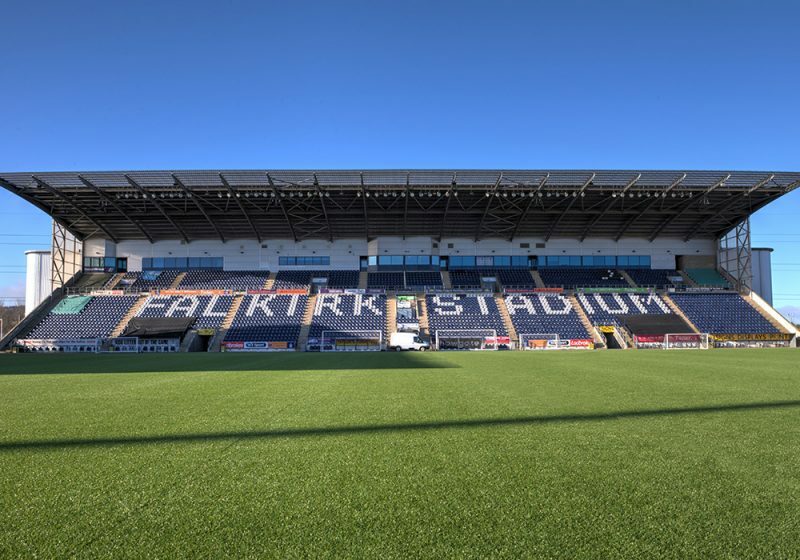 Falkirk Football Club would ask all supporters travelling to the Falkirk stadium by car to refrain from parking in the nearby residential areas. First Bus have confirmed to the club that Matchday Services 98 & 99 have been withdrawn due to them no longer being commercially viable. This is a decision that is outwith our control, however we understand that it will frustrate some supporters. Please scroll down for information on buses running from the Town Centre. THE FALKIRK STADIUM CAN BE REACHED BY THE FOLLOWING ROUTES. Trains: Two services go to Falkirk, the main Glasgow to Edinburgh service goes through Falkirk High Station but is a fair distance from the stadium although well served by taxis. The second station is Falkirk Grahamston served with services on the Dunblane and Glasgow lines. The stadium is approximately a 30 min walk from the town centre. Alternately, the bus services from the town centre reach the Stadium in around 15 minutes. Buses: The following routes run from Falkirk Bus Station which is in the centre of the town. Bus services 3 & 4 (towards Grangemouth) and also service 5 (destination Bo’ness) stop outside the stadium. The bus station is approx 5 minutes from Grahamston Station. Bus timetables are available at the stadium. Cars from Glasgow and the west: should take the M80 then the M876 before joining the M9. Leave the M9 at the exit for BP Grangemouth Junction 6 and then turn right at the end of the slip road. Follow the road for approximately 200yds to the Earlsgate Roundabout before going under the motorway at the roundabout and then following the Grangemouth to Falkirk road. The Falkirk Stadium is on the left hand side. Cars travelling from Edinburgh and the east: should leave the M9 at Junction 5 and proceed along the road to Falkirk for about 1 mile. The Falkirk Stadium is on the right hand side. There are limited car parking facilities for both home and away supporters. Supporters will be directed to the appropriate parking areas by the police and on duty stewards. To help fans travelling, new signage has been put in place to help with directions. Coaches: Away coaches will be parked in the coach park at the rear of the North Stand. The park can accommodate 25 coaches. Should this capacity be exceeded an overflow facility will be made at a nearby location. Match Day Traffic Information: To assist fans travelling to the stadium by car or coach, up to the minute traffic news is available from Central FM 103.1. Walking & Cycling: Falkirk Football Club actively promotes a healthy lifestyle and as such promotes walking and cycling. The Falkirk Stadium sits in an Eco Park which features picturesque walks and cycle tracks. Cycle parking is available at the bike racks at the front of the Main Stand. Copies of the Falkirk Green Travel Map are available at the club. Pitch Dimensions: 115 yds X 74 yds. Facilities for Disabled Supporters: Sheltered Accommodation for disabled supporters in the West, North and South Stands. Toilet facilities are also provided.